A guide you can't afford to miss! Are you planning your 'bucket list' family vacation to Yellowstone - just to feel a bit overwhelmed at the number of choices before you? Do you fear that you will miss something in your planning? Are you confused by the different campground options - which ones can be reserved, which ones can't, and where to make reservations? 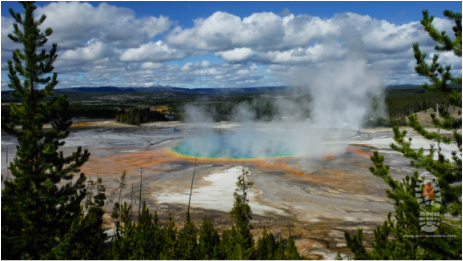 Yellowstone is a huge place with countless alternatives for lodging, travel and activities. You can spend endless hours searching for answers online and still not have all the information you need. We have made multiple trips to Yellowstone National Park with our children, and this book is a summary of all that we have learned and all that we wish we had known as we planned our trips. 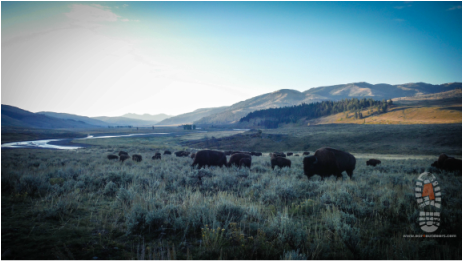 We tell you everything you need to know to make the most of your time in Yellowstone, and we break everything down by region so that you don't spend all of your time in the car instead of seeing the sights. If you are still not quite ready to buy, check out our video to the right for more information and highlights from our most recent trip or see below for a sample from the book. At 3,472 square miles, Yellowstone is a big place (almost three times the size of Rhode Island) with 466 miles of roads. And since there are literally dozens of sights to see, it is tempting to simply jump in your car and drive to as many as possible. But don't let this become just another road trip. Yellowstone is essentially a wild place, and you should try to make time to enjoy it as such. 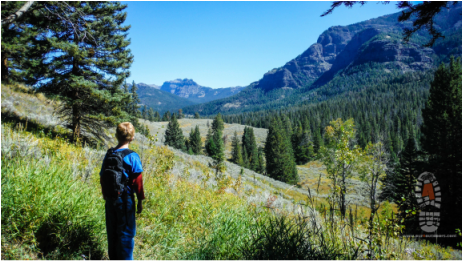 Get outside, get off the pavement, and experience the natural as opposed to the man-made. Kids need to experience nature, and the only way to really do it is to get out there. Spend a few nights in the tent, go for a hike on a dirt path, paddle or swim in a natural body of water, get a little dirt under your nails (we tell you how in this book!). For many kids, something as simple as that might be the most memorable part of the trip - the time they were even a short distance away from 'civilization'. Since Yellowstone is wild, wireless and cellular coverage is spotty or non-existent. So if you expect to use the web to plan your vacation once you arrive there, you will be out of luck. Make sure this eBook is downloaded to your device before you go, and that goes for any other resources you are using to plan your vacation as well. Some of the lodges do have wifi access and cell coverage, but it is not something you can count on. Remember that this goes for digital content that you may want for your kids while you are driving. We limit device use with our kids now since they are older and better able to appreciate sights out the window. You won’t be able to stream videos or music for the kiddos while you are there, so download what you think they will need ahead of time. A good compromise on the device debate is to use “books on tape.” You can download digital audio books from many places, including for free from your local library and then your kids have something to listen to but their eyes are still available for looking out the window. This program is comprised of a booklet filled with age appropriate activities that children complete in order to attain the title of "Junior Ranger". Upon completion they will be sworn in by a real ranger to support and defend the park, and they will be given a badge that they can wear proudly. These activities are fun and educational, and they give kids something to do during the inevitable time that will be spent in the car or while they wait for you to make dinner. Our kids always have enjoyed this program in every park that offers it, and we're sure that yours will too. These packets can be picked up at any visitor center in the park and the best part is: they’re free! (the patch shown to the right costs a few bucks, but they give you a plastic pin for free) http://www.nps.gov/yell/forkids/beajuniorranger.htm. In the first tip we encouraged you to get outside, and now we're going to caution you to take it easy. With kids, make your first hike or outing less challenging so that they don't get discouraged right off the bat. And allow extra time because, as adults, we tend to be focused on making it to the destination, but kids are much more about enjoying the journey. Leave time to take breaks, check out a creek or flower along the way, or anything else that might pop up. Kids want time to explore and discover new things, and it is up to you to leave time for this in the schedule. If a young person is not enjoying themselves outside, it is almost always due to two things - they are hungry or they are uncomfortable (cold, hot, sore, feet hurt, etc). Bring lots of good energy snacks and water. I've lost count of the number of times we've been out with our kids and they started getting grouchy and whining, only to take a 5 minute snack break and have them back in high spirits and ready to go. So bring plenty of water, trail mix, granola, nuts, fruit and even candy bars. Napoleon Bonaparte once said that "an army marches on its stomach," and this is even more true of children. Secondly, being outside means being exposed to the elements. This brings adventure but also risks, so be prepared. We always carry an extra fleece jacket or sweatshirt with us on even short hikes, and rain gear is also a good idea on medium or longer jaunts. Sunscreen is also wise as the elevation in Yellowstone means that quite a few more of the sun's UV rays are making it to your skin than at lower elevations. We have a section of the book with more detailed check lists of what to bring for short walks and long hikes, but food, water and protection against the elements are always the most important items. Take a short hike to this amazing view. See a list of easy, moderate, and challenging hikes suitable for kids listed by region in the park to optimize your vacation time. 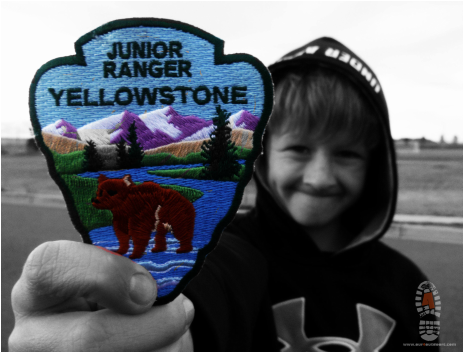 Be a Junior Ranger! And other great activities for kids. Learn where to find views like this one. 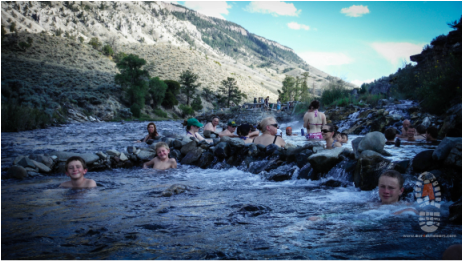 Soak in a natural hot spring! "Having hiked all over the world and in all 50-states with my family, I know the value of getting off the beaten path and finding the hidden gems in our National Parks. 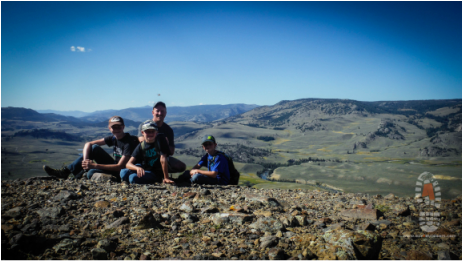 The research and planning for these family friendly excursions can take hours, but with the McAllister's book you can save that time and energy for enjoying the trails in Yellowstone. This guidebook offers a comprehensive, family friendly guide to the park that offers helpful planning, packing and safety tips. 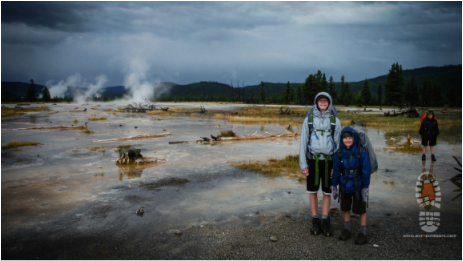 I would recommend this book to anyone traveling to Yellowstone - with or without kids!" - Jennifer Pharr Davis of Blue Ridge Hiking Company.